There are three things that I’ve learnt which I believe you should know about Penguin. Or actually four, but the last one isn’t out until November. Number one, the people here are daring. This is what I’m Thinking, Fast and Slow as I make my way through the suited crowds on the Strand and into the Penguin Towers. Everyone on this street might look like a penguin, but it is my t-shirt clad self who’s actually one (or as I see it, won). In my generation, publishing is not the most popular career or the safest either. But it’s incredibly rewarding. That saying about dead fish swimming with the current? Applicable to penguins too. It takes guts to go down this path, to not follow the crowds to investment banking. And that’s why people here are driven by unusual Paper Promises: exceptional books. Which leads me to my second point: that the work at Penguin is groundbreaking. I’m reminded of this everyday as I walk down the corridor at Penguin Press. One of the most respected brands in publishing, it’s in this division that books are printed not because they’ll be successful, but because they’ll change the world. These are works that further knowledge, add to the public conversation and offer pioneering ideas. They’re Pathfinders; Where Good Ideas Come From; The Better Angels of Our Nature. The risks here aren’t really risks: when you publish a phenomenal book and it doesn’t sell very well, you will have still made a difference. And when The Black Swan eventually surfaces, you know the world will never be the same. Working here is like Moonwalking with Einstein, or rather, several of them: charting unknown territory; taking small steps for humanity; dancing instead of walking. And that’s why, thirdly, the internships at Penguin are unlike any others. Work and fun here are not mutually exclusive, not in social media marketing. It’s all about disrupting platforms; outdoing your predecessors. That means you have to be as creative as you possibly can. Sometimes my ideas seem outrageous even to myself, but it’s often those insane concepts that end up making the cut. 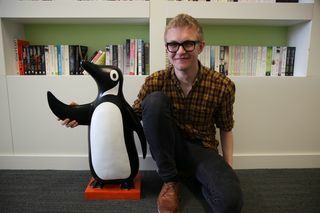 In my role as a social media intern, I’ve run several successful competitions on Facebook and Twitter, contemplated our strategy, reached out to influencers, put up a new Tumblr website (http://penguinpress.co.uk) and much, much more. Instead of coffee runs, I’ve been given responsibility and taught How to be an Explorer of the World, sitting in on meetings from Penguin Australia to the next Spanish bestseller. Which, by the way, is phenomenal and the fourth thing you absolutely need to know about. Let’s go back in time to my third week here: I’m Feeling Lucky. I’ve just read the manuscript for one of the biggest titles this autumn and now I’m taking part in an exclusive meeting on its upcoming marketing campaign. They’re talking about how they’re going to make the author a celebrity in the UK. And not just talking; detailing exactly how that’s going to happen. ‘I’m so excited,’ one of the editors says with a smile on her face. She has no idea: I can barely sit still. I wonder if they can tell? Weeks later, I’m asked to stay on as a freelancer in the company and help execute a digital marketing campaign for the book. I can hardly wait. And I promise, neither can you, in approximately 2-3 months. So, the gist of it all? Don’t follow trends. Set them. That Spanish bestseller? The Yellow World by Albert Espinosa. Out? 1 November. Facebook? At www.facebook.com/theyellowworld My internship? The best ever. Your next job application? Addressed to Penguin Books UK, 80 Strand, London WC2R 0RL. Great post! Your internship seems like an invaluable experience; you are one lucky guy. I wish I could apply, but I’m stuck in America and, unfortunately, they’re not as cool. I’m pretty sure they lack a life-size Penguin to hang out with. Sounds like a swell place to work Kalle. Thanks for the insight. I wish I could apply, but I’m stuck in America and, unfortunately, they’re not as cool. I’m pretty sure they lack a life-size Penguin to hang out with. A lot of site had suffer with the new Google penguin in the past. cheap ugg boots on the ugg canada online shop! Thank goodness for social media, because while keeping an eye on Twitter and on the Penguin Careers page on Facebook, I learned that Dutton, one of my favorite imprints, lost their marketing intern at the last minute and needed a replacement. I immediately e-mailed in my materials, and within an hour, I had a call from Human Resources to come in for an interview the next morning. When it is time to party, especially the elderly tend to like the long sleeve shirt in light colors like white, cream and pink. Thanks for the challenge. Now, I am thinking on how to set trends because following is easier compared with setting trends. Cool photo with the penguin. Previous Post The Penguin Essentials: Part 2.